This quick start provides a basic guide for deploying a Kafka cluster along with all Confluent Platform components in your Docker environment. By the end of this quickstart, you will have a functional Confluent deployment against which you can run any number of applications. To keep things simple, you can start with a single node Docker environment. Details on more complex target environments are available later in this documentation (More Tutorials). 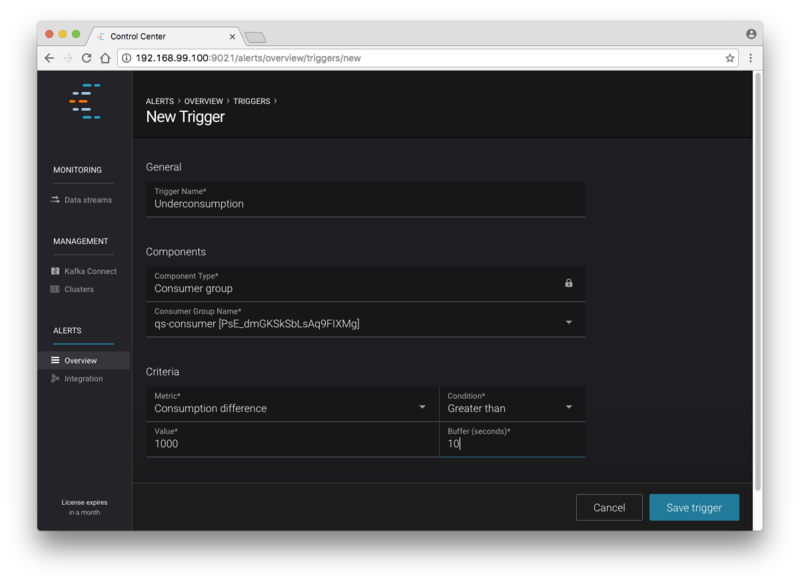 You will also be configuring Kafka and ZooKeeper to store data locally in their Docker containers. You should refer to the documentation on Docker external volumes for examples of how to add mounted volumes to your host machines. Mounted volumes provide a persistent storage layer for deployed containers, which allows images such as cp-kafka and cp-zookeeper to be stopped and restarted without losing their stateful data. If you’re running on Windows or macOS, you’ll need to use Docker Machine to start the Docker host. Docker runs natively on Linux, so the Docker host will be your local machine if you go that route. If you are running on Mac or Windows, be sure to allocate at least 4 GB of RAM to the Docker Machine. For this quickstart, you can use Docker Compose or Docker client. Docker Compose is a powerful tool that enables you to launch multiple Docker images in a coordinated fashion. It is ideal for platforms like Confluent. Before you get started, you will need to install both the core Docker Engine and Docker Compose. Once you’ve done that, you can follow the steps below to start up the Confluent Platform services. Create and configure the Docker Machine. Important: If you are using Docker for Mac or Docker for Windows, you can skip this step. Clone the Confluent Platform Docker Images Github Repository. An example Docker Compose file is included that will start up ZooKeeper and Kafka. Navigate to cp-docker-images/examples/kafka-single-node, where it is located. Alternatively, you can download the file directly from GitHub. If the state is not Up , rerun the docker-compose up -d command. Now check the ZooKeeper logs to verify that ZooKeeper is healthy. Next, check the Kafka logs to verify that broker is healthy. Test the broker by following these instructions. Now you can take this basic deployment for a test drive. You’ll verify that the broker is functioning normally by creating a topic and producing data to it. You’ll use the client tools directly from another Docker container. Create a topic named foo and keep things simple by just giving it one partition and one replica. For a production environment you would have many more broker nodes, partitions, and replicas for scalability and resiliency. Publish some data to your new topic. This command uses the built-in Kafka Console Producer to produce 42 simple messages to the topic. bash -c "seq 42 | kafka-console-producer --request-required-acks 1 --broker-list localhost:29092 --topic foo && echo 'Produced 42 messages.'" You must explicitly shut down Docker Compose. For more information, see the [docker-compose down](https://docs.docker.com/compose/reference/down/) documentation. This will delete all of the containers that you created in this quickstart. The confluentinc/cp-docker-images GitHub repository has several other interesting examples of docker-compose.yml files that you can use. The following steps show each Docker container being launched in detached mode and how to access the logs for those detached containers. If you prefer to run the containers in the foreground, you can do so by replacing the -d (“detached”) flag with -it (“interactive”). 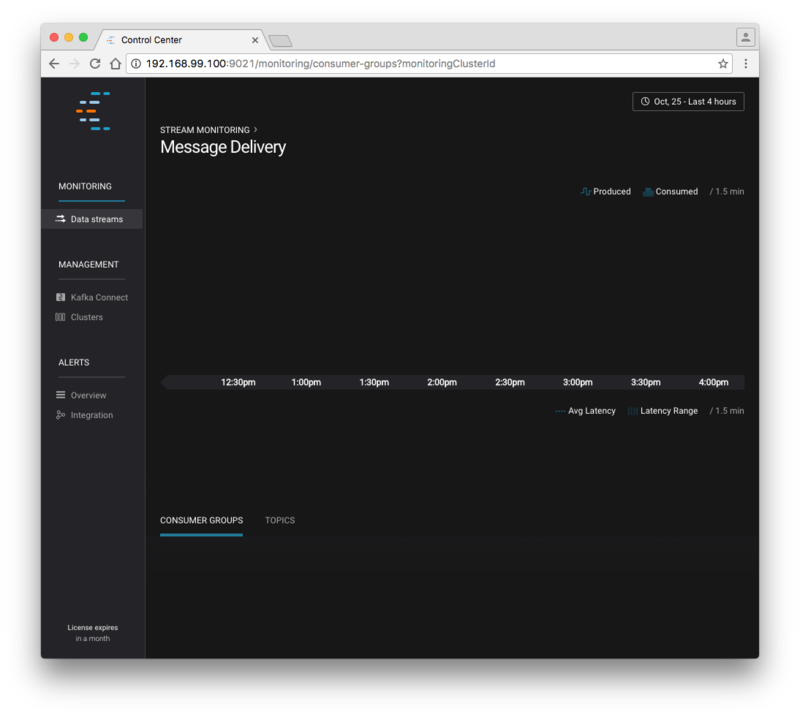 Containers launched in interactive mode will stream the log messages for the Confluent service directly to the terminal window. For that reason, you’ll need a separate terminal for each Docker image launched in interactive mode. Create and configure the Docker Machine. This example creates a VirtualBox VM with ~6 GB of memory to serve as your Docker host. If you want to reuse a Docker Machine you’ve already created under the name “confluent” run: docker-machine start confluent instead. All of the subsequent commands should be run from that terminal window to ensure proper access to the running Docker host. To execute Docker commands from a new terminal window, simply execute the eval $(docker-machine env confluent) first. Start ZooKeeper. You’ll need to keep this service running throughout, so use a dedicated terminal window if you plan to launch the image in the foreground. This command instructs Docker to launch an instance of the confluentinc/cp-zookeeper:3.3.1 container and name it zookeeper. You also specify that you want to use host networking and pass in the required parameter for running ZooKeeper: ZOOKEEPER_CLIENT_PORT. For a full list of the available configuration options and more details on passing environment variables into Docker containers, see the configuration reference docs. Use the following command to check the Docker logs to confirm that the container has booted up successfully and started the ZooKeeper service. With this command, you’re referencing the container name that you want to see the logs for. To list all containers (running or failed), you can always run docker ps -a. This is especially useful when running in detached mode. Note that the message shows the ZooKeeper service listening at the port you passed in as ZOOKEEPER_CLIENT_PORT above. Network port already in use. In that case, you’ll see a message indicating that the ZooKeeper service could not bind to the selected port. Simply change to an open port or identify (and stop) the Docker container that has a service using that port. Insufficient resources. In rare occasions, you may see memory allocation or other low-level failures at startup. This will only happen if you dramatically overload the capacity of your Docker host. You’ll notice that the KAFKA_ADVERTISED_LISTENERS variable is set to localhost:29092. This will make Kafka accessible from outside the container by advertising it’s location on the Docker host. You also passed in the ZooKeeper port that you used when launching that container a moment ago. Because you are using --net=host, the hostname for the ZooKeeper service can be left at localhost. Also notice that KAFKA_OFFSETS_TOPIC_REPLICATION_FACTOR is set to 1. This is needed when you are running with a single-node cluster. If you have three or more nodes, you do not need to change this from the default. Now you can take this very basic deployment for a test drive. You’ll verify that the broker is functioning normally by creating a topic and producing data to it. You’ll use the client tools directly from another Docker container. First, you’ll create a topic. You’ll name it foo and keep things simple by just giving it one partition and only one replica. Production environments with more broker nodes would obviously use higher values for both partitions and replicas for scalability and resiliency. 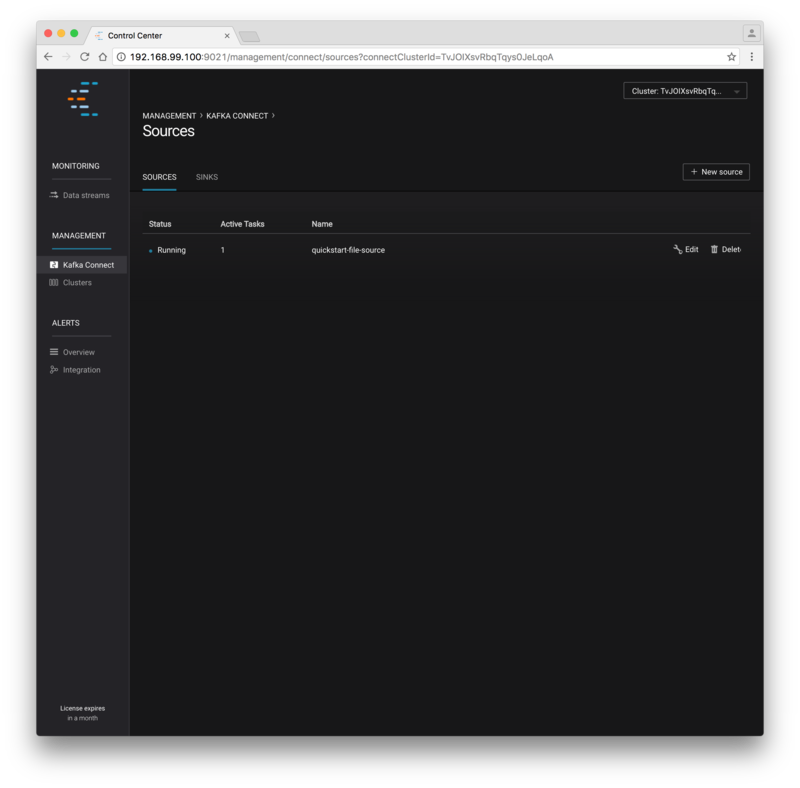 Now that you have Kafka and ZooKeeper up and running, you can deploy some of the other components included in Confluent Platform. You’ll start by using the Schema Registry to create a new schema and send some Avro data to a Kafka topic. Although you would normally do this from one of your applications, you’ll use a utility provided with Schema Registry to send the data without having to write any code. As you did before, you can check that it started correctly by viewing the logs. For the next step, you’ll publish data to a new topic that will leverage the Schema Registry. For the sake of simplicity, you’ll launch a second Schema Registry container in interactive mode, and then execute the kafka-avro-console-producer utility from there. 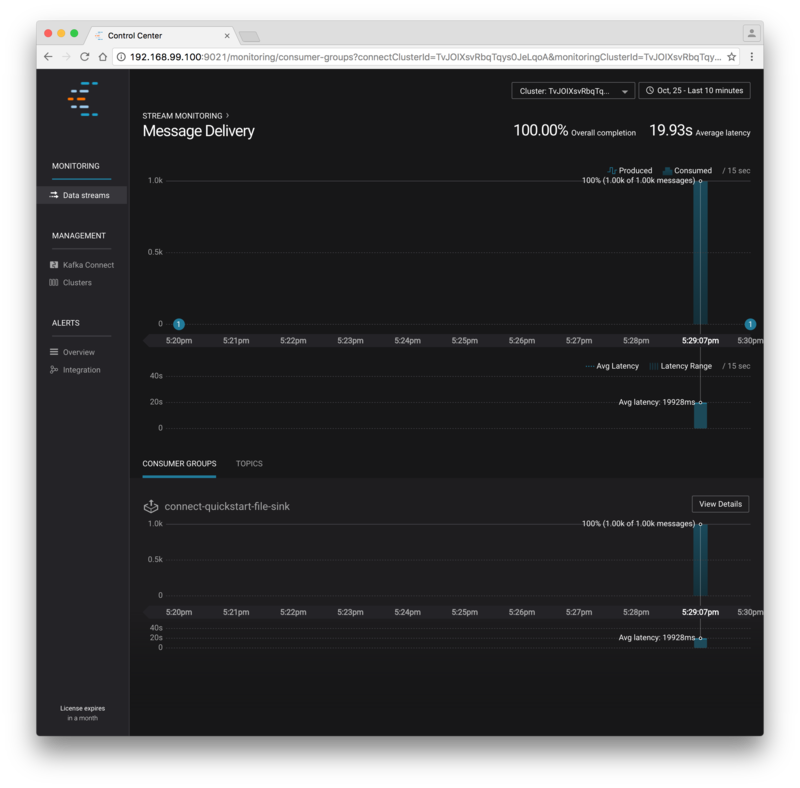 Direct the utility at the local Kafka cluster, tell it to write to the topic bar, read each line of input as an Avro message, validate the schema against the Schema Registry at the specified URL, and finally indicate the format of the data. If you hit Enter with an empty line, it will be interpreted as a null value and cause an error. You can simply start the console producer again to continue sending messages. When you’re done, use Ctrl+C or Ctrl+D to stop the producer client. You can then type exit to leave the container altogether. Now that you’ve written avro data to Kafka, you should check that the data was actually produced as expected to consume it. Although the Schema Registry also ships with a built-in console consumer utility, you’ll instead demonstrate how to read it from outside the container on your local machine via the REST Proxy. The REST Proxy depends on the Schema Registry when producing/consuming avro data, so you’ll need to pass in the details for the detached Schema Registry container you launched above. This section describes how to deploy the REST Proxy container and then consume data from the Confluent REST Proxy service. The first step in consuming data via the REST Proxy is to create a consumer instance. Your next curl command will retrieve data from a topic in your cluster (bar in this case). The messages will be decoded, translated to JSON, and included in the response. The schema used for deserialization is retrieved automatically from the Schema Registry service, which you told the REST Proxy how to find by setting the KAFKA_REST_SCHEMA_REGISTRY_URL variable on startup. The Control Center application provides enterprise-grade capabilities for monitoring and managing your Confluent deployment. Control Center is part of the Confluent Enterprise offering; a trial license will support the image for the first 30 days after your deployment. This portion of the quick start provides an overview of how to use Confluent Control Center with console producers and consumers to monitor consumption and latency. 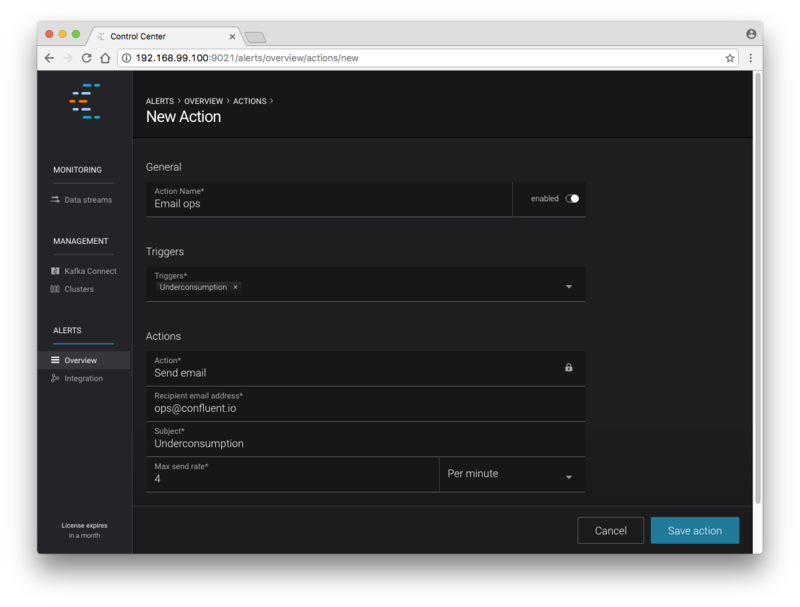 You’ll launch the Confluent Control Center image the same as you’ve done for earlier containers, connecting to the ZooKeeper and Kafka containers that are already running. 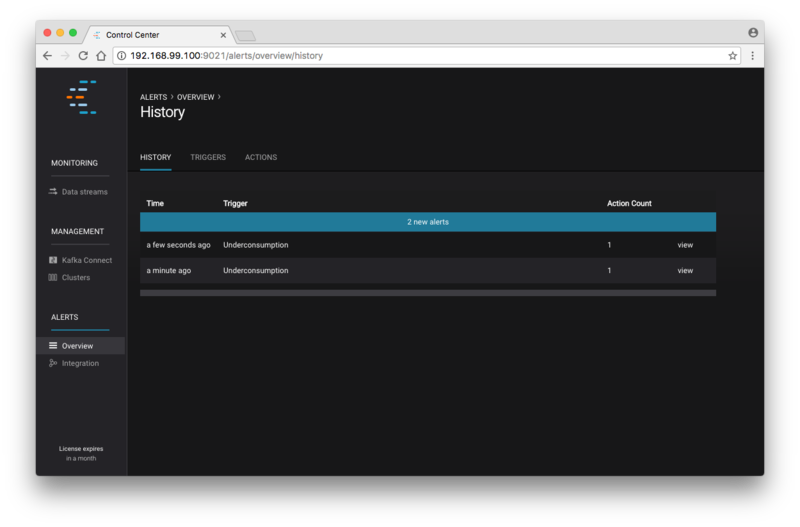 This is also a good opportunity to illustrate mounted volumes, so you’ll first create a directory on the Docker Machine host for Control Center data. Now you start Control Center, binding its data directory to the directory you just created and its HTTP interface to port 9021. You may notice that you have specified a URL for the Kafka Connect cluster that does not yet exist. Not to worry, you’ll work on that in the next section. To see the Control Center UI, open the link http://<ip-of-docker-host>:9021 in your browser. The Docker Host IP is displayed with the command docker-machine ip confluent. If your Docker daemon is running on a remote machine (such as an AWS EC2 instance), you’ll need to allow TCP access to that instance on port 9021. This is done in AWS by adding a “Custom TCP Rule” to the instance’s security group; the rule should all access to port 9021 from any source IP. Initially, the Stream Monitoring UI will have no data. Next, you’ll run the console producer and consumer with monitoring interceptors configured and see the data in Control Center. First you need to create a topic for testing. The message will repeat every 10 seconds, as successive iterations of the shell loop are executed. You can terminate the client with a Ctrl+C. You’ll use the console consumer with the monitoring interceptor enabled to read the data. You’ll want to run this command in a separate terminal window (prepared with the eval $(docker-machine env confluent) as described earlier). You’ve intentionally setup a slow consumer to consume at a rate of 1000 messages per second. You’ll soon reach a steady state where the producer window shows an update every 10 seconds while the consumer window shows bursts of 1000 messages received every 1 second. The monitoring activity should appear in the Control Center UI after 15 to 30 seconds. If you don’t see any activity, use the scaling selector in the upper left hand corner of the web page to select a smaller time window (the default is 4 hours, and you’ll want to zoom in to a 10-minute scale). You will notice there will be moments where the bars are colored red to reflect the slow consumption of data. Confluent Control Center provides alerting functionality to notify you when anomalous events occur in your cluster. This section assumes the console producer and consumer you launched to illustrate the stream monitoring features are still running in the background. The Alerts and Overview link on the lefthand navigation sidebar displays a history of all triggered events. To begin receiving alerts, you’ll need to create a trigger. Click the “Triggers” navigation item and then select “+ New trigger”. Set the trigger name to be “Underconsumption”, which is what will be displayed on the history page when your trigger fires. You need to select a specific consumer group (qs-consumer) for this trigger. That’s the name of the group you specified above in your invocation of kafka-console-consumer. Set the trigger metric to be “Consumption difference” where the condition is “Greater than” 1000 messages. The buffer time (in seconds) is the wall clock time you will wait before firing the trigger to make sure the trigger condition is not too transient. After saving the trigger, Control Center will now prompt us to associate an action that will execute when your newly created trigger fires. For now, the only action is to send an email. Select your new trigger and choose maximum send rate for your alert email. Let’s return to your trigger history page. In a short while, you should see a new trigger show up in your alert history. This is because you setup your consumer to consume data at a slower rate than your producer. In this section, you’ll create a simple data pipeline using Kafka Connect. You’ll start by reading data from a file and writing that data to a new file. You will then extend the pipeline to show how to use Connect to read from a database table. This example is meant to be simple for the sake of this quickstart. If you’d like a more in-depth example, please refer to the Using a JDBC Connector with avro data tutorial. First, let’s start up a container with Kafka Connect. Connect stores all its stateful data (configuration, status, and internal offsets for connectors) directly in Kafka topics. You will create these topics now in the Kafka cluster you have running from the steps above. It is possible to allow connect to auto-create these topics by enabling the autocreation setting. However, it is recommended that you do it manually, as these topics are important for connect to function and you’ll likely want to control settings such as replication factor and number of partitions. Next, create a topic for storing data that you’ll be sending to Kafka. For this example, you’ll create a FileSourceConnector, a FileSinkConnector and directories for storing the input and output files. If you are running Docker Machine then you will need to SSH into the VM to run these commands by running docker-machine ssh <your machine name>. First, let’s create the directory where you’ll store the input and output data files. Remember, you must do this within the Docker Host. Next, start a Connect worker in distributed mode. This command points Connect to the three topics that you created in the first step of this quickstart. You will now create your first connector for reading a file from disk. To do this, start by creating a file with some data. Again, if you are running Docker Machine then you will need to SSH into the VM to run these commands by running docker-machine ssh <your machine name>. (You may also need to run the command as root). The next step is to create the File Source connector. Now that the connector is up and running, try reading a sample of 10 records from the quickstart-data topic to check if the connector is uploading data to Kafka, as expected. You’ll want to do this in a separate terminal window, retaining the ssh session to the Docker Host for later commands. Finally, you can check the file to see if the data is present. Once again, you will need to SSH into the VM if you are running Docker Machine. Next you’ll see how to monitor the Kafka Connect connectors in Control Center. Because you specified the monitoring interceptors when you deployed the Connect container, the data flows through all of your connectors will monitored in the same ways as the console producer/consumer tasks you executed above. Additionally, Control Center allows us to visually manage and deploy connectors, as you’ll see now. Select the Management / Kafka Connect link in the Control Center navigation bar. Select the SOURCES and SINKS tabs at the top of the page to see that both the source and sink are running. 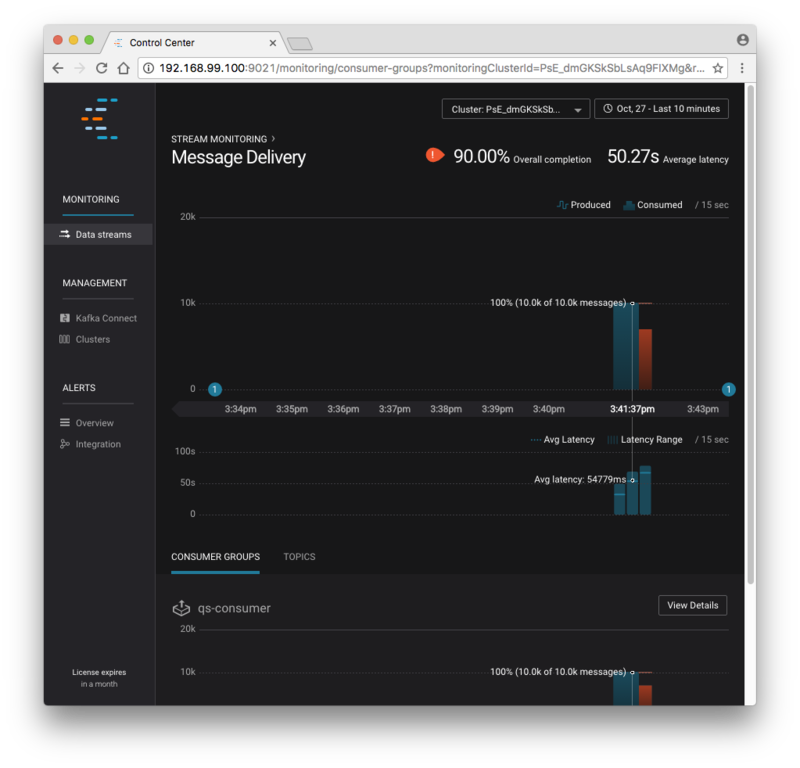 You should start to see stream monitoring data from Kafka Connect in the Control Center UI from the running connectors. Remember that the file contained only 1000 messages, so you’ll only see a short spike of topic data. After you’re done, cleanup is simple. Run the command docker rm -f $(docker ps -a -q) to delete all the containers you created in the steps above for your target Docker Host. Because you allowed Kafka and ZooKeeper to store data on their respective containers, there are no additional volumes to clean up. If you also want to remove the Docker machine you used, you can do so using docker-machine rm <your machine name>.